Like most people in the entertainment industry, Jim used appearances on talk shows to preview projects he had in production or had recently completed. His documentary program Youth ’68 had aired in April 1968 and given the timely subject matter, generated tremendous interest. The Mike Douglas Show, a popular daytime talk show from 1961-1982, was a good platform for Jim to share his program with audiences who had missed it. Douglas’s show featured a wide variety of guests, often for a week at a time. In July of 1966, Jim and his colleagues Jerry Juhl, Jerry Nelson, Frank Oz, and Don Sahlin spent a week in Philadelphia as co-hosts of the show. Over the course of the week, audiences saw just about every element of the Henson repertoire. This included Rowlf the Dog fresh from his three-year stint on The Jimmy Dean Show, various comic bits with obscure, abstract characters like Sclrap Flyapp, philosophical wanderings that combined puppetry, animation and filmed material, and musical numbers with Kermit and various other Muppets. Jim and the others appeared on camera explaining the latest projects, demonstrating various techniques, and introducing a sampling of some of the hundreds of television commercials they produced. Some of the guests that appeared alongside the Henson gang were Hermione Gingold, Florence Henderson and the Mills Brothers. Jim Henson appeared again on The Mike Douglas Show several times in the late 1960s and throughout the 1970s, but that first week of shows captured an important time in Jim Henson’s career, documenting his creative efforts in so many areas, and demonstrating the breadth of his talent and imagination. Curious viewers can see these shows in the library of The Paley Center for Media in New York and Los Angeles. 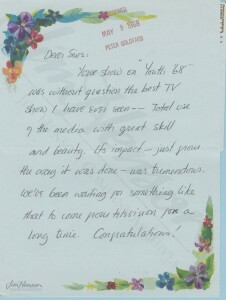 Fan letter received by Jim regarding Youth ’68. 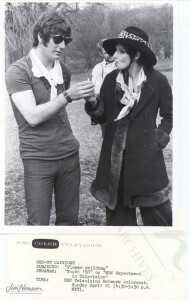 Promotion image for Youth ’68. This entry was posted in 05-May '68, 1968, Appearances, Youth 68 and tagged Don Sahlin, Florence Henderson, Frank Oz, Hermione Gingold, Jerry Juhl, Jerry Nelson, Kermit, Mills Brothers, Rowlf, The Jimmy Dean Show, The Mike Douglas Show. Bookmark the permalink.